Steve Conroy: Boston Bruins defenseman Kevan Miller didn’t skate yesterday and wouldn’t expect him to play in this series. Conor Ryan: Bruins forward Jake DeBrusk didn’t practice yesterday. DeBrusk had said after Thursday’s game that he was “100 percent” after crashing into the boards. Boston Bruins: Both Sean Kuraly and John Moore were on the ice in no-contact jerseys before practice. Kuraly was able to stickhandle. 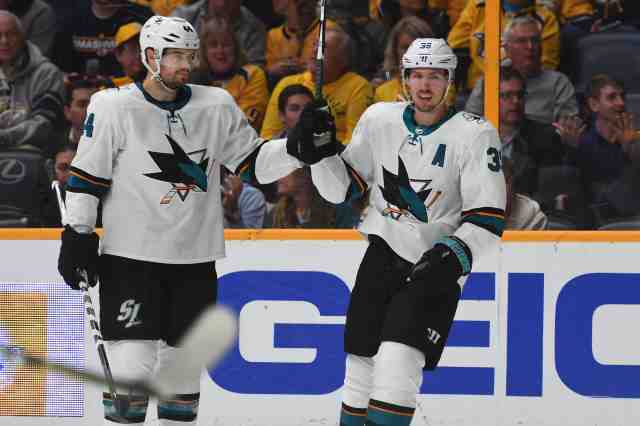 Nick Cotsonika: San Jose Sharks forward Logan Couture returned for the third period, defenseman Marc-Edouard Vlasic didn’t. Both blocked shots. Kevin Kurz: There was no update on Vlasic after the game. Couture said that he left the game as he thought he “lost a testicle” and added that “luckily” it’s still there. Bryan Burns: Tampa Bay Lightning defenseman Anton Stralman was on the ice for their morning skate. Stephen Whyno: Washington Capitals Lars Eller left Monday’s practice for upper-body maintenance, also didn’t practice yesterday. Ken Wiebe: Winnipeg Jets forward Nikolaj Ehlers went through and passed concussion protocol. He was able to return to the game. Ehlers had some issues during last years playoffs so they will monitor him in the upcoming days. Darren Dreger: Nikita Gusev received his release from KHL contract and is now eligible to sign a one-year deal with the Vegas Golden Knights and join them for the playoffs. Darren Dreger: Gusev is expected to join the Golden Knights this weekend. NHL Player Safety: Tampa Bay Lightning Nikita Kucherov will have a hearing today for his hit on Columbus Blue Jackets Markus Nutivaara. Pierre LeBrun: Don’t believe that NHL Player Safety view Kucherov’s hit as bad as Maple Leafs Nazem Kadri last year – who go three games.